As always, something to ease into the week; after all, PMQ6 seemed like a hard nut to crack! The diagram shows a large regular hexagon with a smaller hexagon nested within it. The vertices of the smaller hexagon are the mid-points of the sides of the larger hexagon. 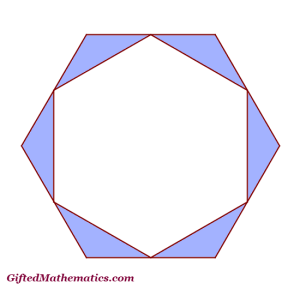 What is the ratio of the area of the large hexagon to the total area shaded in blue? A slightly easier question is: what is the ratio of the area of the smaller hexagon to the total area shade in blue? Why is the 2nd question quicker to do? Can you now do the 1st question without any calculations?